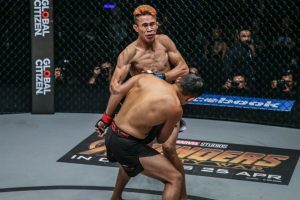 With performances that resulted to bringing home four world championship belts to Baguio City, it was no surprise that Team Lakay and several of its members were named among the top performers in ONE Championship for 2018. Another Pinoy, Jeremy “The Jaguar” Miado joined them on top of the fray. 2018 was the year Team Lakay made the biggest splash in the history of ONE promotion. The group had been a consistent performer in ONE for years past but last year has been nothing like any other. 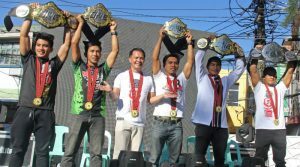 Entering 2018, the humble local gym produced only two champions, Eduard Folayang, who headlined the promotion’s inaugural event in September 2011 and eventually won the World Lightweight title on November 11, 2016, and Honorio Banario, who became the promotion’s first featherweight champion on February 2, 2013. That’s two champions in seven years of participation in the promotion. They doubled that output last year. Geje Eutaquio was first to strike by decisioning Adriano “Mikinho” Moraes in a thrilling 5-round title unification bout to become the undisputed ONE Flyweight Champion in June 23, 2018. Joshua Pacio was crowned next when he outgunned Yoshitaka Naito in a rematch for the ONE strawweight title last September 22. That revenge win, however, was nowhere near Kevin Belingon’s stature as he cemented his being unofficially “The King of Rematches” as he outpointed Bibiano Fernandes and became the undisputed ONE Bantamweight World Champion last November 9, ending an 8-year reign of the most dominant champion the promotion has ever seen. Eduard Folayang aptly put an exclamation point for the gym’s performance of the year by putting on a show of offensive fireworks display to reclaim the vacant ONE world lightweight title over Amir Khan on November 23. The four championships they won last year tied the second total championships of any other country in their ONE history, currently held by Japan and Brazil. Next on the list is two shared by five countries. The promotion give credence to “The Silencer’s” spectacular wins and the quality of opponents he had to had him this feat. Belingon pump a spinning wushu sidekick to Andrew Leone’s midsection to sent him flying across the squared circle and followed it up with non-stop ground and pound to end their April 20 bout at the 1:27 mark of round two and pocket a TKO victory. The he proceeded to convincingly outpoint then two-weight title holder Martin Nguyen to lead a Philippine historic night on July 27. He completed a scintillating 3-0 personal record last year by unifying the Bantamweight belts. Pacio did something unseen to ONE audience as of July 27, 2018 and it will probably be associated with him as long the promotion exists. He basically created a move, his variation of an armlock/hammerlock and named it the “Passion Lock”. 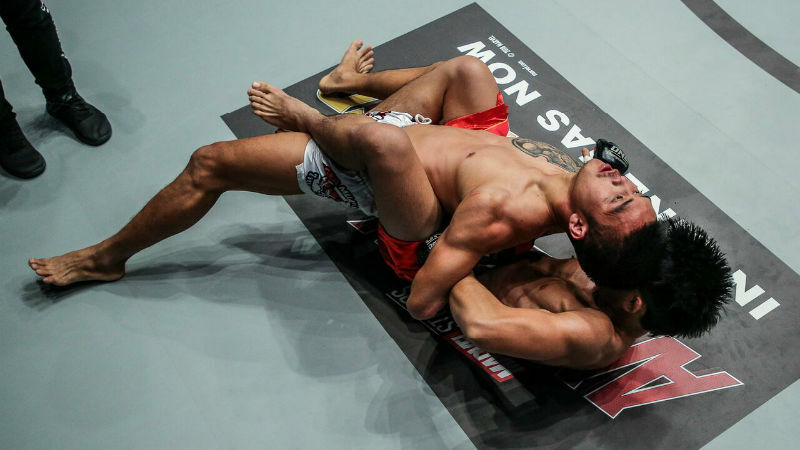 According to the promotion’s website, such move was never executed before in ONE Championship history. Pacio’s match with Thai hero Pongsiri Mitsatit expected to be a stand-up but the fighters did not stay on the feet for very long as the Team Lakay standout caught Mitsatit’s leg kick, took him down and took the side control, barely a minute into the first round. From there, Pacio quickly transitioned to full mount and rained a barrage of punches and elbows. As Mitsatit struggles to escape, “The Passion” took his back as if going for the rear-naked choke. Instead of going for the choke however, he grabbed one of Mitsatit’s arms and twisted it around his back to give the Thai no other options but to tap. The move ended the match at the 3:37 mark of round one. Miado overcame insurmountable odds to knocking out former world champion Dejdamrong Sor Amnuaysirichoke in the first round last March 24, 2018. Miado was a overwhelming underdog when both fighters engaged in a wild exchange of punches, which turned out to be in favor of Miado. The Jaguar connected with a perfectly-timed, thunderous right cross in the stand-up fighting and sent the Muay Thai Legend crashing to the canvas to play the spoiler to a hometown crowd. The referee quickly rushed forward to stop the contest before Miado was able to land any follow-up shots, officially ending the bout at the 1:29 mark of the opening round by knockout. The victory moves Miado’s his record to 7-2, and now includes a knockout of the most decorated strawweights in ONE Championship in his resume. Kingad sustained career momentum when he recorded a 3-0 fight record last year. He registered wins over Sotir Kichukov, Ma Hao Bin, and Yuya Wakamatsu. That immaculate slate improve his career resume to 8-1. It’s even more appreciable when you would realize that his only lost on November 10, 2017 was to Moraes! Incidentally, he set to return to action against Tatsumitsu “The Sweeper” Wada on January 25 here in the Philippines. The “Landslide” record a clean 3-0 slate last year like Shinya Aoki, to co-own this feat. The 34-year-old Landslide downed a pair of undefeated Russian warriors to solidify his spot in the lightweight tilt. He gave 25-year old Kharun “Predator” Atlangeriev, who is undefeated in 11 fights and was making his ONE debut at that time, his first career loss returned to the cage on May 18. Two months later, on July 27, he dealt another previously undefeated Russian, Sambo World Champion Aziz Pahrudinov, his first loss at the MOA. He cap his year with the title winning performance against Khan. In addition to these, some other performances landed as runner-ups. Folayang was in the running for Warrior of the Year. The Belingon vs Fernandes bout and Folayang vs Khan bout were runner ups in the Performance of the Year category. The Kingad vs Wakamatsu bout, Belingon vs Fernandes bout and Folayang vs Khan bout were runner ups in the Bout of the Year category. Finally, the Edward Kelly’s knockout of Meas Meul, Miado’s KO of Amnuaysirichoke, and Jomary Torres’ slamming of April Osenio in an All-Filipino showdown were runner ups in the Most Spectacular Knockout category.